Toss - Royal Challengers Bangalore won the toss and elected to bowl. Sarfaraz Khan to Marcus Stoinis. Leg spinner back of a length, outside off stump on the front foot driving, to long off for 2 runs, fielded by Rahul. RCB finally get a win on the board. It has taken them seven games but their season is underway. It might be too late to get into the playoffs but their best players have stood up today and produced a fantastic chase. Virat Kohli hit a fine 67 while AB de Villiers finished unbeaten on 59 along with Marcus Stoinis (28 from 16). First time Kings XI have been beaten at this venue this year but they came across a better team on the day. Mohammed Shami to Marcus Stoinis. Slower ball back of a length, outside off stump backing away pulling, mis-timed to long on for 1 run, fielded by Agarwal. Mohammed Shami to Marcus Stoinis. Length ball, outside off stump on the front foot driving, to extra cover for no runs, fielded by Ashwin. Mohammed Shami to AB de Villiers. Length ball, outside off stump on the front foot driving, thick edge in the air uncontrolled to deep cover for 1 run, fielded by Curran. Mohammed Shami to AB de Villiers. Length ball, outside off stump on the front foot Slog, mis-timed to mid wicket for 2 runs, fielded by Ashwin. Andrew Tye to Marcus Stoinis. Half volley, outside off stump Deep in crease driving, to deep point for 2 runs, fielded by Singh. APPEAL! Andrew Tye to AB de Villiers. Length ball, outside off stump on the front foot driving, to extra cover for 1 run, fielded by Ashwin, appeal made for Run Out. AB is too quick to get run out. He can take singles to fielders inside the ring with no trouble. Andrew Tye to Marcus Stoinis. Length ball, outside off stump moves in front Slog, mis-timed in the air uncontrolled to deep mid wicket for 1 run, dropped catch by Ashwin. Ravichandran Ashwin to Marcus Stoinis. Carrom length ball, outside off stump on the front foot pushing, to long off for 1 run, fielded by Tye. Ravichandran Ashwin to Marcus Stoinis. Off break back of a length, outside off stump on the back foot driving, to deep extra cover for 2 runs, mis-fielded by Khan, fielded by Curran. Ravichandran Ashwin to Marcus Stoinis. Off break length ball, outside off stump on the back foot driving, to cover for no runs, fielded by Khan. Ravichandran Ashwin to Marcus Stoinis. Off break length ball, outside off stump on the front foot cutting, to deep point for 2 runs, fielded by Curran. Ravichandran Ashwin to Marcus Stoinis. Carrom length ball, middle stump on the front foot defending, to short extra cover for no runs, fielded by Khan. Ravichandran Ashwin to AB de Villiers. Off break length ball, outside off stump on the back foot pushing, to long off for 1 run, fielded by Tye. Mohammed Shami to AB de Villiers. Yorker, off stump on the front foot working, to long on for 1 run, fielded by Agarwal. Mohammed Shami to Marcus Stoinis. Short, outside off stump on the back foot Steer, to third man for 1 run, fielded by Khan. Mohammed Shami to Marcus Stoinis. Back of a length, outside off stump on the back foot working, to short mid wicket for no runs, fielded by Gayle. Mohammed Shami to AB de Villiers. Back of a length, outside off stump on the back foot pulling, inside edge to silly point for 1 run, direct hit by Shami. Mohammed Shami to Virat Kohli. Back of a length, outside off stump on the front foot working, mis-timed to mid on for 1 run, fielded by Agarwal. Royal Challengers Bangalore won the Toss and Opt to Bowl!!! Follow KXIP vs RCB live cricket score ball by ball commentary and know what is happening on the ground with us. Let’s look at the KXIP vs RCB previous matches records. Hello, all welcome to the live cricket score IPL 2019 Match 28th Kings XI Punjab vs Royal Challengers Bangalore. Catch Indian Premier League KXIP vs RCB Live Score ball by ball commentary with fast scorecard updates, Results and much more. 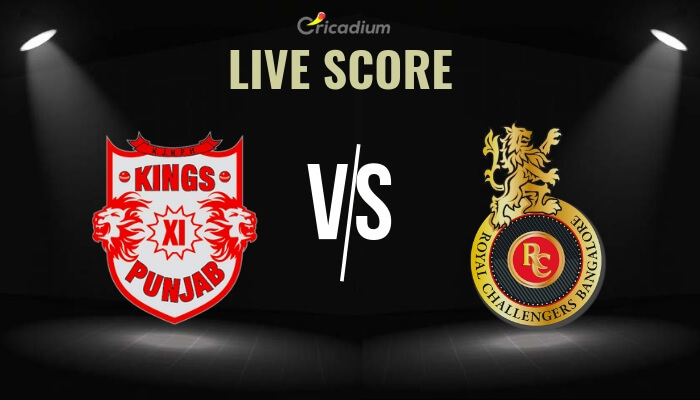 For KXIP vs RCB Live Score ball by ball commentary stay connected to Cricadium.